There is often confusion about the difference between solar flares and coronal mass ejections (CMEs). Both solar flares and CMEs are energetic events which occur on the Sun. These events are both associated with high energy particles. In the case of a CME, coronal material is ejected into space at high speeds, sometimes in the direction of Earth. Both flares and CMEs depend on magnetic fields on the Sun. The most obvious difference between a solar flare and a CME is the spatial scale on which they occur. 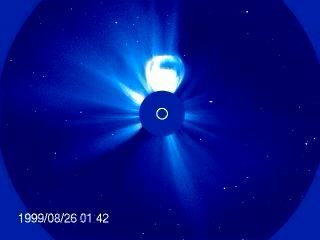 Flares are local events as compared to CMEs which are much larger eruptions of the corona. 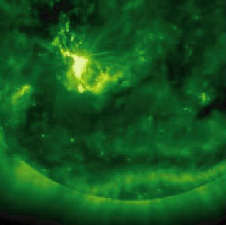 The left image above shows a bright solar flare erupting in an active region on the Sun. The image on the right shows a CME exploding off the Sun. Notice that this CME is even larger than the Sun itself, which is represented by the white circle in the middle of the frame. Solar flares and coronal mass ejections often occur together, but each can also take place in the absence of the other. The next pages will discuss flares and CMEs in more detail.